PIENINIA OBLONGA — SKELETAL PARTS OR ENDOPARASITES OF KERATOSA SPONGES ? Abstract: The paper presents the distribution and taxonomy of the Rhaetian coral fauna in the Tatric, Fatric, Hronic and Silicic paleogeographical zones of the Western Carpathians. The taxonomic spectrum of the corals from the Fatric zone is the most typical of the Carpathians, and resembles that of the Alps in the abundance of reimaniphylliid corals and frequent phaceloid growth forms, but it differs from the Alpine spectrum in its lower generic diversity. The assemblage from the northernmost zone, formed by the Tatric Superunit, is closest to the Early Jurassic fauna from the British Isles. Two new species are described: Zardinophyllum carpathicum sp.n. and Stylophyllopsis bobrovensis sp.n. Abstract: The problematic bodies Pieninia oblonga Borza & Misik common in Barremian to Upper Eocene shallow-water sediments were considered as algae, rudist fragments, echinoderm remains, or sclerites of Gorgonaceae. They were recently found inside the skeleton of sponges, probably Keratosa. The growth stages of these bodies are described. The question remains whether they are unusual sclerites or parasites. The way of their loosening from the skeletons was not observed. Abstract: Lower Tithonian (Upper Jurassic) serpulids (Polychaeta, Sedentaria) have been found in the Czorsztyn Unit in the western part of the Pieniny Klippen Belt. A new species, named as Spirorbis imprimus sp.nov., accompanied by other specifically indeterminable serpulid remnants, was described. Epizoan worms found on shells of both benthic and nektonic animals indicate neritic environmental conditions for the whole assemblage. 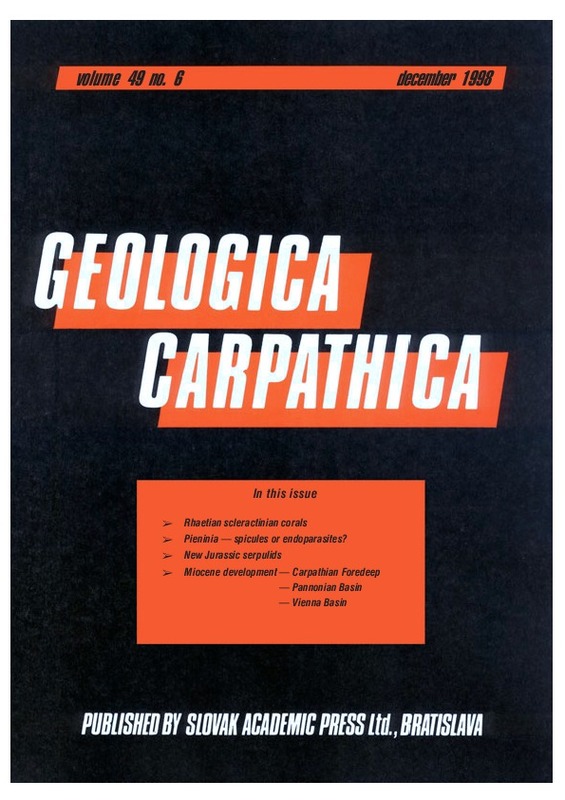 Abstract: The Early to Middle Miocene Carpathian foredeep in Poland (PCF) developed as a peripheral foreland basin related to the moving Carpathian front. The subsidence of the basin was controlled both by the sediment and thrust-induced load. The main episodes of intensive subsidence in the PCF correspond to the period of progressive emplacement of the Western Carpathians onto the foreland plate, with exception of the "dormant" Carpathian frontal thrust during the "Middle Badenian" salinary event when a low subsidence or uplift took place. The important driving force of tectonic subsidence was the emplacement of the nappe load related to the subduction roll-back. During that time the loading effect of the thickening of the Carpathian accretionary wedge on the foreland plate increased and was followed by progressive acceleration of total subsidence. The mean rate of the Carpathian overthrusting, and north to north-east migration of the axis of depocentres reached 12 mm/a at that time. During the Late Badenian-Sarmatian time the rate of advance of the Carpathian accretionary wedge was lower than that of pinch-out migration and, as a result, the basin widened. The Miocene convergence of the Carpathian wedge resulted in the migration of depocenters and onlap of the successively younger deposits onto the foreland plate. Abstract: A continuous succession of Ottnangian-Badenian sediments along the southern margin of the Pannonian Basin System indicates transition from lacustrine to marine depositional environments. The Ottnangian lake is characterized by the alternation of silts deposited from suspension and sands representing sedimentation from turbidity currents, debris flows or grain flows. These facies continue into the Karpatian, although the depositional environment becomes marine. At the transition into the Early Badenian, the environment shallows, and is represented by high energy siliciclastic shoreface and stacked Gilbert-type fan deltas. The succession is terminated with marls deposited in an offshore environment, with intercalated biocalcarenites from turbidity currents. The marine sediments are subdivided into two depositional sequences separated by a correlative conformity of a type 2 unconformity. The first sequence consists of a transgressive system tract which is represented by the Karpatian offshore sediments, and a highstand system tract, which is represented by offshore sediments deposited close to the nearshore, shoreface and stacked Gilbert-type fan deltas of the Karpatian and the Lower Badenian age, showing rapid progradation. The second sequence consists of a shelf margin system tract composed of aggrading shoreface sediments, and a transgressive system tract composed of Lower Badenian offshore sediments. Abstract: Late Miocene sedimentary environments were related to the shallow brackish- to fresh-water lake in the Slovak part of the Vienna Basin. During the Pannonian time, the geological settings gradually changed from deltaic-dominated in Papp’s A–C zones, through offshore-dominated (D–E zones), up to coal-bearing, limnic-dominated (F–H zones). The variation in sediment supply, eustatic sea-level oscillations and the subsidence influenced the formation of accommodation space and related geometry and lithology of sedimentary bodies. The sedimentary cycles were characterized by seismostratigraphic, sedimentological methods, well-log data and fossils content and interpreted in terms of sequence-stratigraphic concept. The Pannonian A, B zones of the recognized sedimentary cycle represents a duration of approximately 0.5 Ma, with possible further subdivision into two higher-order cycles. These cycles are regarded as parasequences within the late stage of the 3rd-order sequence, which continued from the Sarmatian. In the Pannonian sediments of the C–H zones, a further four full sequences were determined. The definition of the sequences is based on the recognition of lowstand, transgressive and highstand systems tracts. Erosional surfaces were recognized on seismic sections, and in the sedimentary record they are marked by redeposited older fauna in the lowstand deposits. During the sea-level rise a backstepping reflectors termination pattern is visible on seismic sections and during the transgressions rapid changes of faunal assemblages were also determined. The highstand deposits are often represented by condensed sections and low-aerated conditions in the Vienna Basin centre. The maximum flooding surface within the D zone represents the initial highstand stage and can be indicated by a dinoflagellates-rich horizon.